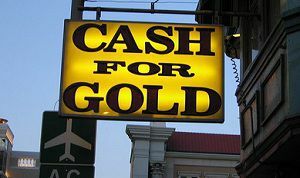 Home » Building Additional Income » Should You Sell Your Gold Jewelry for Cash? Right now, many people are still feeling the pinch from the recent recession — and worried that we might be headed toward another recession. With concerns about the economy increasing, before the last concerns were even resolved, it is no surprise that many people are looking for ways to earn a little extra cash. One way that many people are trying to get a little extra cash is to sell their gold jewelry. With gold prices on the rise — now above $1,800 an ounce — it can be tempting to take in your jewelry and sell it for cash. There are a number of options for selling gold jewelry, from mailing it in to a company seen on TV or the Internet, to attending “gold parties” in town. The problem, though, is that you need to be careful to avoid getting ripped off. And, you want to make sure that you are getting the best bang for your buck. The first thing you need to do is figure out the karat weight of all of your gold jewelry. This will be important when it comes to determining how much it is “worth” — especially if you are being offered a price for melting it down. Remember that, unless your gold jewelry is 24K, it is not pure gold. If you have anything other than 24K (and you probably do), you have to realize that there are other metals mixed in, and you won’t get the same price. On top of that, you have to realize that some jewelry is only gold plated. This means that there is only a thin coating of gold over some other metal. As a result, you might not have as much gold as you think you do. If you have a piece of jewelry with a 10K gold plating, it’s not going to fetch much at all when the actual amount of gold is figure out for melting down. Before you take your gold anywhere (and look for reputable places to sell your gold), sort it out by karat, if you know it, and figure out which pieces are only coated with gold, and which are gold all the way through. Then, have each category weighed and evaluated separately. If you’re not careful, some places will put them all together, and then quote you a price for everything, based on the least valuable jewelry. Also, consider the melt it down price, versus the price you could get if you sell it as jewelry. This is especially important if you have a unique and interesting piece of jewelry. You might actually have better luck selling it to a pawn shop, consignment jewelry shop or independent jewelry store than selling to someone who claims to be melting it down. You might even have better luck using an online auction site or the local classifieds. Before making your decision, have the jewelry appraised for its melt down price, and then also for its value as a piece of jewelry (perhaps at different reputable places). Compare the prices, and see what you are better off doing. You might be surprised to find that your jewelry can fetch a better price whole, than melted down, and you should consider this before mailing it in to a shady cash for gold Internet site. What are Alternative United States Local Currencies? Great tips! Never even thought about the possibility of them lumping good and bad gold together and giving a lower price. It makes me wonder with so many things to look out for, mailing it anywhere before you get it appraised is not a good option. Thanks again for the helpful and informative tips.